3/ … a new, and as yet completely undetermined, legal regime on issues such as immigration, trade, customs, agriculture and fisheries. 4/ This means that new rules will not be subject to existing EU law rules, rendering existing rights vulnerable. 6/ … what it calls “deficiencies” in retained EU law, and to “implement the withdrawal agreement” with the remaining 27 EU member states. 8/ … on the part of the government to minimise scrutiny of its policy choices. 10/ In some cases, UK courts will even have freedom to ignore existing case law of the European Court. 11/ MPs must recognise the extent of the change provided for in this bill, and scrutinise the proposed arrangements accordingly. 104 pages of the #Brexit #WhitePaper reduced to 10 slides. & with more sense than time. 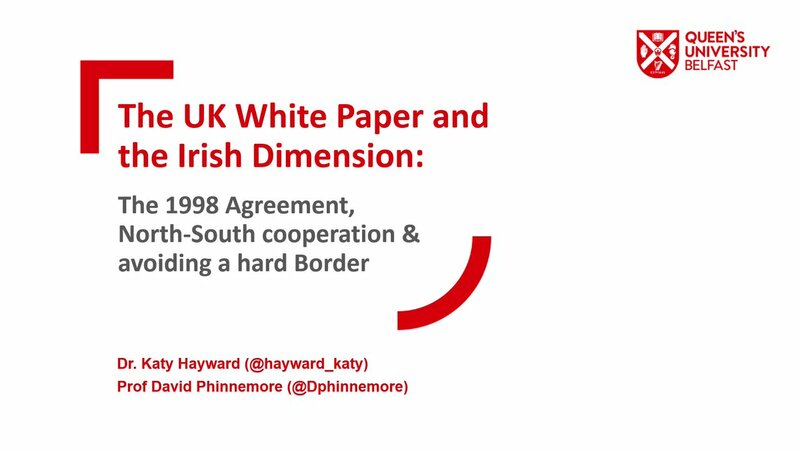 @DPhinnemore & I have scrutinised the WP in light of #JointReport commitments to NI/IRL & the UK's alternative #backstop. A bit of context-setting (plus explanation of our imaginative colour coding). 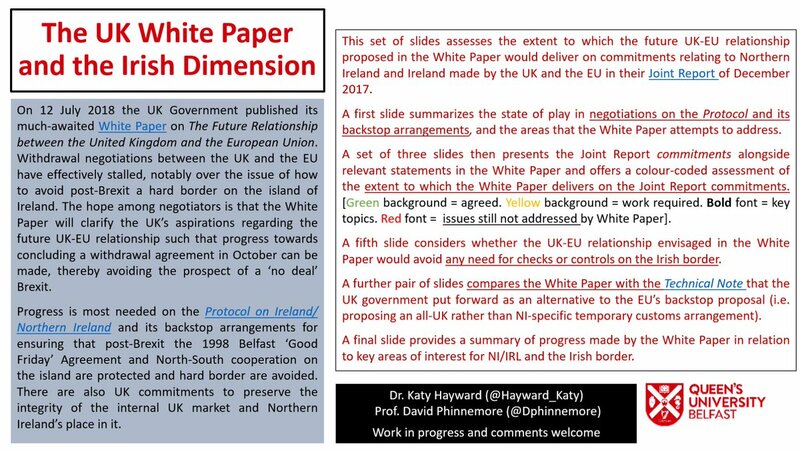 The White Paper is in part an effort by UK govt to prove a NI-specific #backstop to be unnecessary. But remember Protocol for NI/IRL in the Withdrawal Agmt is abt much more than a customs border. 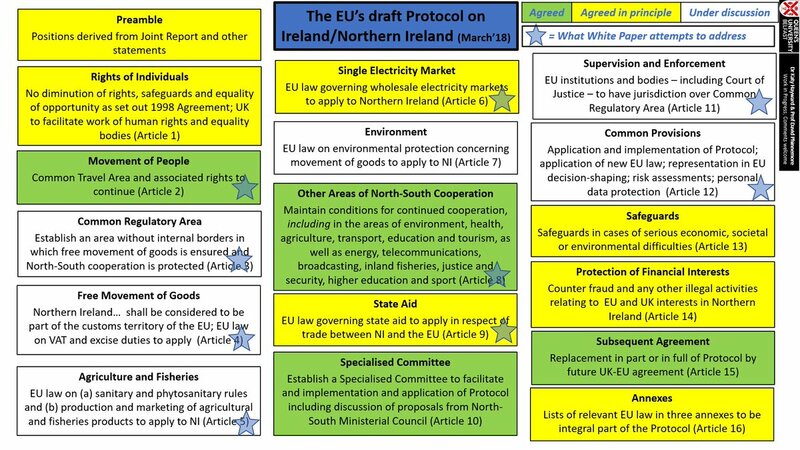 A reminder of where we are up to on that Protocol on NI/IRL in the draft Withdrawal Agreement. With added stars 🌟 to identify which bits the White Paper attempts to address (or negate) most directly. Cadbury moved factory 2 Poland 2011 with EU grant. Ford Transit moved 2Turkey 2013 with EU grant. Jaguar Land Rover recently agreed 2 build a new plant in Slovakia with EU grant, owned by Tata, same company who trashed our steel industry & emptied workers pension funds. Dyson gone 2 Malaysia, with EU loan. Crown Closures, Bournemouth (Was METAL BOX), gone 2Poland with EU grant,employed 1,200. M&S manufacturing gone 2far east with EU loan. EU Commission has published the draft mandate for #Brexit transition talks. (1) As expected, Com demands that whole of EU acquis should continue to apply to the UK, incl. all four freedoms, Euroatom, justice and home affairs, even down to the current UK's opt out regime. (2) UK will no longer benefit from EU FTAs during transition. This is detrimental to UK economy, but also implies that it may strike its own FTAs during transition. THREAD: Disagreement on the ECJ's role remains one of the biggest hurdles in #Brexit talks. This is how to vault it. There will be fun graphics and a moody photo of me in a carefully chosen shirt along the way. Stay with me. 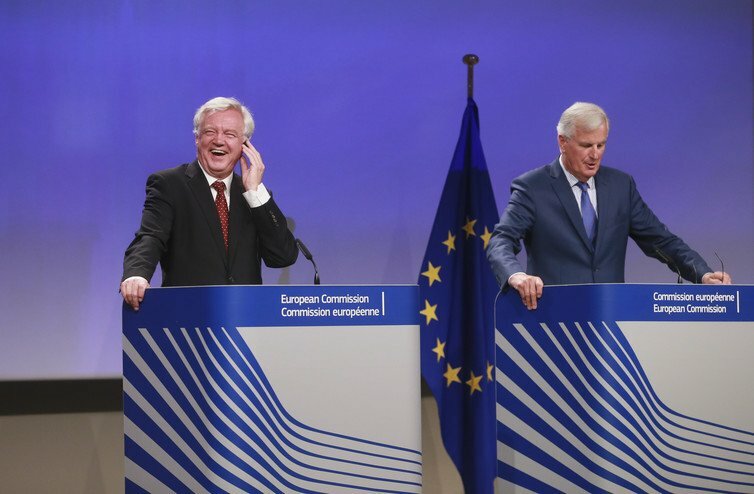 Basics: UK and EU need a dispute resolution mechanism to sort disagreements about the meaning and implementation of the Brexit deal(s).